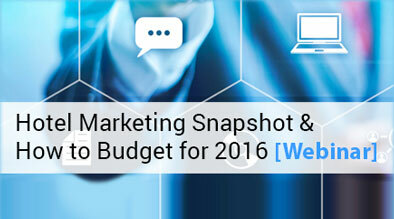 We were glad to provide webinar attendees with digital marketing strategies and budgeting ideas for continued online success in 2016. We covered topics from dynamic content targeting and competitive analysis tools to ongoing Internet marketing initiatives such as hotel website design, paid marketing, social media, content marketing, and search engine optimization strategies. We also received several questions on the chatline we were unable to discuss on the webinar, please see below for answers. Q1: What is the best way to link different businesses under one corporation? Ex: we own hotels and apartments in the same building with a mall and a grocery store- can we have one website for all? The best practice would be to have a unique website (and social media) presence for each business. If resources constrain you to one website, make sure there is at least one page uniquely dedicated to each business. From an off-page organic perspective, you absolutely should maintain unique listings for each individual business in all maps, aggregators, IYPs, etc. Q2: What are your thoughts on using different tracking numbers for different organic listings (Google, Yelp, Bing)? Q3: How accurate is the dynamic content targeting? We often see that the Google aggregated data is not always on target. When people travel and are connected to wifi, it may make them look like they’re from a different location, for example. Dynamic content targeting for your website is generally based on IP address, so if the person lives in New York but is visiting a website while in California, the website will serve them content appropriate for the California audience. Audience targeting on platforms like Facebook are a lot more accurate to the individual user, as the targeting is based on facts about that specific person, not general information acquired by IP address. Q4: Visits to sites have been down from 10-28% over the last three years. What are ways to increase visits? Without knowing details, it sounds like that is a website technology issue. The last few years have seen significant changes in the requirements Google has to be able to understand your website and then display it in search results. I’d recommend a site audit using various free tools like Google Webmaster, GTmetrix and Google Structured Data Testing Tool, then probably revamp the website. Q5: What were the free tools highlighted to compare performance? GTmetrix: Analyze your site speed and your competitors’ site speeds. Remember for every second delay you lose 7% in conversions and that a score of A or B is good! Interesting write man! Hotels in kanyakumari Have to learn a lot of things from this blog post. Take care!